J. Jane Consulting | anamer castrello. washington, d.c. | opera singer. mezzo-soprano. Once upon a time, there was a beautiful young girl name Anamer who lived with her parents in Guaynabo, Puerto Rico. Anamer had one brother, and they grew up in a home filled with music and love. Their parents sang daily, as they cleaned the house, prepared dinner, or as they sat on the front porch— entertaining neighbors and friends. However, Anamer did not dare sing along, as she thought that her voice could not be as beautiful. She adored her parents and always quietly listened. And then one day, she garnered the courage to start singing with her family. She then pursued a career as a pop singer. Eventually, Anamer moved to Hawaii… a move that would change her life forever. Anamer suddenly lost her voice due to an allergic reaction to volcanic ash. She could not speak. She could not sing. She was devastated. Anamer met with many doctors to determine a course of action. Little did she know, that the unfortunate reaction to volcanic ash would be a catalyst to a career as an influential opera singer. The doctors sent her to a vocal therapist to help her regain the use of her vocal chords. After one visit, Anamer was encouraged to take voice lessons. She quickly learned that she had special vocal chords that could be trained to sing opera. And the rest, as they say… is magic. Already fluent in Spanish and English, Anamer Castrello began to study German and Italian languages. 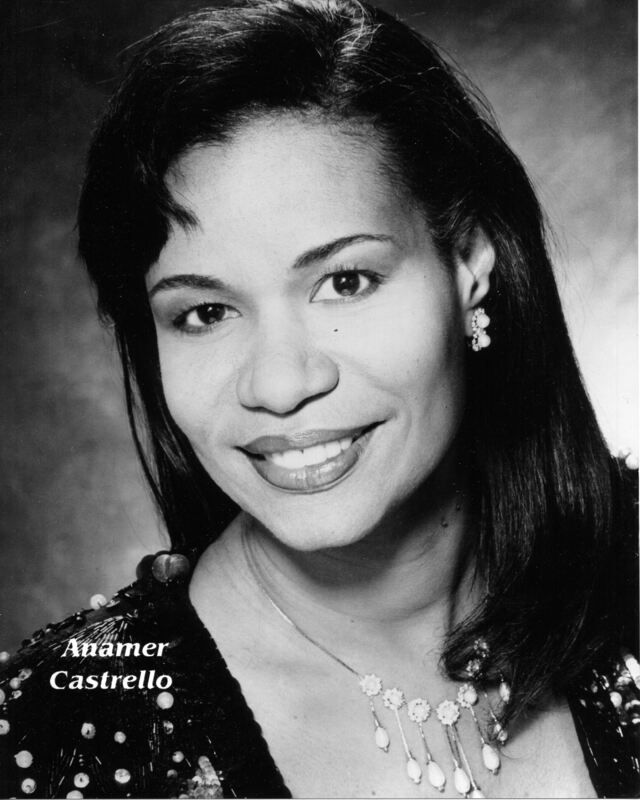 And today, Ms. Castrello holds a Bachelor of Arts degree in Humanities with a concentration in Piano from the University of Puerto Rico, a Master of Arts degree in Music Education for Colleges and Universities from New York University and a Master of Music degree in Opera Performance from the University of Maryland at College Park. She recently earned her Doctorate in Musical Arts in Vocal Performance from Catholic University of America. How did I get to meet this incredibly talented opera singer? A friend introduced me to an exceptionally gifted playwright and teaching artist by the name of Mr. Tom Minter. I immediately reached out to Tom to request an interview with a woman from the Washington National Opera. And, voila! I was on my way to experience a tribute to Marian Anderson — an African American contralto and one of the world’s most celebrated singers of the twentieth century. Mr. Minter created the Marian Anderson program for the Washington DC Public Library to be showcased during Women’s History Month. He wanted to present the educational program in collaboration with Anamer performing specific music, resonate with the journey of Marian Anderson. Their mission was to shed a light on the life of Marian Anderson— the woman who was shunned by the Daughters of the Revolution in 1939. A little history: Due to the color of her skin, one of the world’s greatest opera singers was not welcome to sing on the stage at Constitution Hall. Disgusted by this decision, first lady Eleanor Roosevelt, a member of the DAR, not only resigned as a member of the DAR, she supported the effort to make the steps of the Lincoln Memorial the stage for the most important musical events of the 20th Century. Mr. Minter and Ms. Castrello not only shed a light on the incomparable Marian Anderson, they inspired an appreciation of opera and love of humankind. It is no wonder that Anamer Castrello was able to pull off this beautiful tribute. The sheer enthusiasm that radiates from Anamer Castrello’s smile is enough to give her a standing ovation. And my words could never depict the rich emotion that her voice evokes. I am honored she agreed to join the j. jane conversation. How did you build the confidence to perform in front of an audience? It’s funny but the way I started dealing with performing in front of an audience, was with what I call now, “our family soirees”. My Godmother Annie, and her sister, Aurin would host almost weekly family reunions. The adults would play bingo or other games and the children would play and talk, but there would be a time allotted for the ‘artists in the family’ to perform. At the very least, there were 40 minutes set aside for music and poetry. My Mom, Dad, and I would always do something. I was horribly nervous when this first started, but because at the time I was taking guitar lessons from a neighbor, I would sing newly learned songs and felt the guitar was shielding me from my fear. The more I did it, the nerves would be more controlled. That is how I started to sing for others. I learned that preparation is a key factor on building confidence. I started practicing with my mother and that helped control the nerves. My mother taught me to start thinking about the meaning of the words and the feelings they would evoke in me, and that helped tremendously. Nerves never leave you completely and it’s o.k. to be a little nervous. Nerves are necessary— they keep you focused. Nerves show that you respect your audience, and that you want to offer them the best experience possible. Sometimes pretending the real performance is just another practice helps, it’s not about being perfect it’s about being honest, positive and open to react to any situation. Nowadays I find when I am singing a role it’s even easier to forget my own worries if I am in tune with the character portrayed at the moment and her relationship with others within the story. If you are an aspiring performer, I suggest that you enjoy your own performance, and stay in the moment when you are performing. I would have to go back to that time in Hawaii where I lost my voice completely due to the volcanic ash allergy. That volcanic ash was all over the sky in Oahu even though the volcano was in the big island of Hawaii. This allergy turned out to be a good thing. The doctors assigned a voice teacher as part of my treatment. That teacher found out I could sing, and she convinced me of the importance of understanding the voice and developing it to its maximum potential. I learned how to take care of my body. That would prove to be more than beneficial in the long run! She was absolutely right! While it was a great challenge to navigate through this medical phenomenon. It turned out to be blessing. Determination and perseverance are the keys to achieving anything you want in life. If someone wanted to pursue a career in the world of opera… what steps do they need to take to get involved? First, study music and gain instrumental skill. Then cultivate your instrument, your voice, and take voice lessons with a good teacher. Learn to act, opera is a story told through singing. Study the languages of opera (Italian, French, German, English). Commit to it, study hard, and love your art. Practice your vocal technique, repertoire, and be prepared to rehearse a lot. Rehearsal will become your full time job, and you should love every minute of it. Enter in competitions and auditions to get started in the business. Do not take rejection personally, and look for choices not limitations. Never stop learning. Living a graceful life is about living lovingly. It is important to be kind and mindful of others, while having a purpose. Be grateful, stay positive, be conscious and gentle, and live soulfully… and joyfully. Visit Anamer’s website to learn more about her work. Listen to Anamer Catrello sing Ave Maria. Please disregard the shoddy footage taken. Admittedly, this work would not make my cameraman brother proud. I have invested in a tripod since this event— lesson learned. Looking for another good read? Mr. Minter has a beautiful blog entitled Off the Stoop. Marian Anderson on the Lincoln Memorial steps singing My County ‘Tis of Thee. A very special thank you to Ms. Miller. Without your introduction, this interview would not have been possible. I am still smiling for getting the opportunity to meet these incredibly talented people.